’Well arrived at Ibrox optimistic of success having won their previous two league games but were crushed after having Carl McHugh sent off for handball and a penalty awarded against them at 1-1 in the 32nd minute. “Obviously it was really disappointing,” said ex-Grimsby Town ace Tait (28). “Obviously it’s a terrible result for us regarding the scoreline and it’s totally unacceptable on our part. “We don’t want to use the red card and penalty as an excuse, definitely. For 30 minutes we’re in it. “It was one each but things change in the game and we have to adapt to that. “Regardless if it’s a refereeing decision or whatever. “But we didn’t do that and we lay down far too easily. “I think once they scored their fourth and fifth goals we just lay down, possibly waiting for the end of the game. “There’s still quite a lot of time to go in the game and that’s not acceptable. I can only apologise to the travelling fans who came and try and put it right. Referee Craig Thomson angered visiting fans by dismissing McHugh and awarding a spot kick in front of a large Old Firm crowd – just like he did when red carding Cedric Kipre in last season’s Betfred Cup final defeat to Celtic – but Tait was remaining philosophical. Tait was asked if he felt the decision of whistler Thomson (pictured inset) to send off McHugh and award a spot kick was too harsh. He replied: “I don’t know the rules any more to be honest with you. “If it’s double punishment or what I don’t know. “The referee has made his decision and we’ll stand by that. In the wake of such a disappointing result, Tait and his mates won’t get the chance to put the humbling out of their system by going for three points this Saturday. 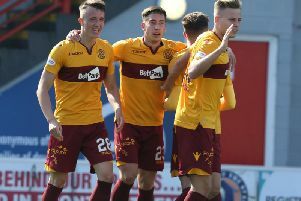 An international break this weekend means that Motherwell’s next league game is a home encounter against Aberdeen a week on Saturday. And the rampaging fullback – touted for a Scotland call-up due to his consistently good displays – said that ’Well’s capitulation in Glasgow was made all the more painful by the fact that they’d beaten St Mirren and Dundee in their previous two Scottish Premiership outings. He said: “Definitely, yeah. I think we came here with a spring in our step and hope we could really come and challenge and get a result. “And it went totally the other way, badly. “But, like I say, we’ve got two weeks until we play Aberdeen. “We’ll go and assess it and look at the things we did wrong and look at the things we could have done better. “And we’ll try and bounce back.